Highlighters for me have become probably my favourite beauty item, and even if i'm having the naturalist of natural makeup days i'll still use a bit of highlight to give my face that extra pop of glow. Granted I don't go all out, but I love a subtle glow for a daily makeup look, so I thought i'd share a few of my everyday favourites! I feel like highlighters we're quite an under rated product in the beauty world, up until a few years ago and bam everyone had a poppin' cheek bone and hasn't looked back since. For me I never really understood highlighters, that was until I really started to use ones that suited my skin tone, as it definitely isn't a one shade suits all situation. Now that i've discovered which shades work for me it has allowed me to really explore and enjoy highlighters for all that they are. On a day to day I love me a subtle highlighter, and it's of a night time/evening out that I really go in when it comes to highlighters. One of my favourites for a very long time has been the Topshop Highlighter (£12) in the shade called 'Crescent Moon' and I love this shade as it's a subtle champagne colour that is really build-able and can work for many makeup looks. I often use this during the day as it's quite subtle, but still gives a lovely pop but it can also be layered up to create a more noticeable highlight. 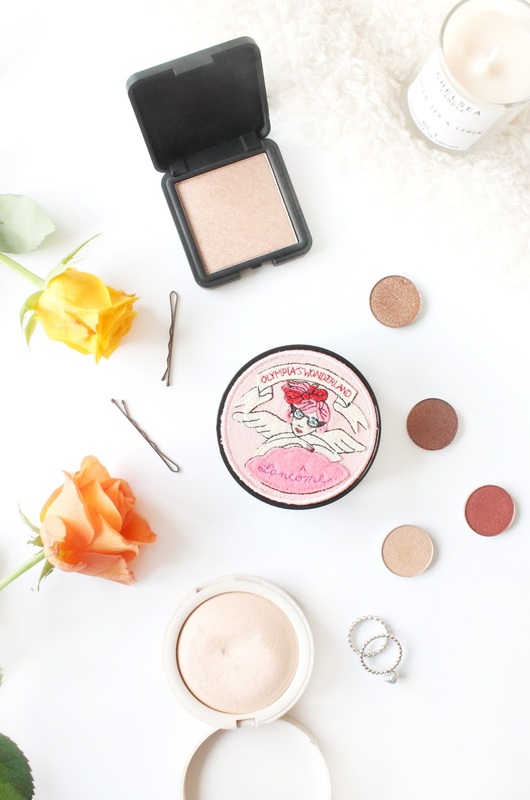 What I love about this blush is that it has a very finely milled formula to it and it glides on beautifully making it quite easy to work with, which is great for someone who is quite new to highlighters like I was when I first purchased this. Another favourite of mine has got to be the 3ina The Highlighter 201* (£) which i've been using on and off now for a few months, and again this is a beautiful champagne highlight shade that is beautiful for an everyday makeup look. The formula of this is slightly different to the Topshop one, and it definitely gives a very subtle glow but again can be built up to give a beautiful glow for an evening makeup look. A recent addition into my highlighter collection is the new Lancome x Olympea Le-Tan Cushion Highlighter* (£30) which really intrigued me when I first received this. Firstly the packaging of this is whole collection is beautiful, and I also really like the concept behind this product. If you've ever used their cushion foundation, or any cushion foundation then this works in a really similar way as you dab you brush or sponge into the cushion within the packaging, and then apply this to your face. I typically make sure that I have a very small amount of product on my brush, and apply this as I would any highlighter by sweeping it across my cheek bones. It's slightly different to a normal highlighter, as it appears more matte than shimmery, but I really like this especially for an everyday look where i'm wanting a more subtle glow.